Practice Area: Practice facilities include a driving range, two practice putting greens and a practice bunker. Description: The Chester Golf Club is located in rural Chester County 6 miles west of I-77 off of exit 62, only minutes from Charlotte or Columbia. The course, which opened in 1971, was designed by Russell Breeden, and is known to many as a “hidden gem.” The TifEagle Ultradwarf Bermuda greens offer a smooth, but testing putting surface. The tree lined 419 Bermuda grass fairways further insure that golfers of all skill levels will have a challenging but fun round of golf. The signature hole, number 12, is a par 5 that requires two shots over water. The course is surrounded by forest land and an abundance of wildlife. B-Man's Take: I haven't played here yet so the description is straight from the course website. 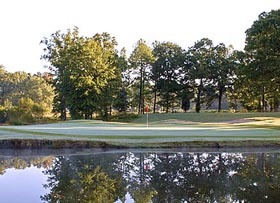 This course is one of a foursome of courses owned by Leroy Springs & Co -- Springfield, Fort Mill and Lancaster being the other 3. It is a nice set of courses usually kept in good shape.